While grocery shopping for our Thanksgiving meal I had a stroll down the magazine isle and saw the newest issues of bon appetit and Food & Wine. Both had cozy looking delicious fall braises on their covers and my mouth began to salivate. Since I was about to start brining my turkey I thought I would also try some similar flavours with a pork roast. So once home I searched the bon appetit archives and came across a suitable recipe online. Now that I’m reading through the recipe again I see that I made quite a few adjustments. I used a bit of the brining salt and herbs meant for the turkey to rub onto the top of the pork roast and left it out on the counter for a couple of hours. In the meantime, I went to Calgary Farmer’s Market to buy fresh local garlic and some really nice shallots. It was a bit out of my way for these two ingredients (though I also managed to pick up a chocolate pecan pie from YUM! Bakery) but I find it’s the most economical way to purchase shallots. If you go to a big box grocery store to buy shallots the quality is sometimes not there and they charge $3.99 for two or three tiny shallots as opposed to $3.99/lb for the lovely shallots at the farmer’s market. Considering I was buying a whole pound of shallots (bon appetit is an American publication and they STILL haven’t switched to metric!!) I saved quite a lot of $$ at the same time as shopping locally. Win & win. It was almost 3 when I got home so I knew I really needed to get a wiggle on so the roast would be done in time for dinner. I peeled all the shallots and halved the larger ones, then I peeled the garlic and apples. I added the cored and cut up apples just before I added the liquids to the pot; a few cups of apple cider and instead of ginger beer I used my home made ginger syrup and a bottle San Pellegrino. This all went into a 300F oven for just over four hours. There was quite a lot of liquid left over which I reduced in a pan to make a nice sauce. It was probably the most moist and flavourful pork roast I’ve ever had and definitely worth being put on the make again list. 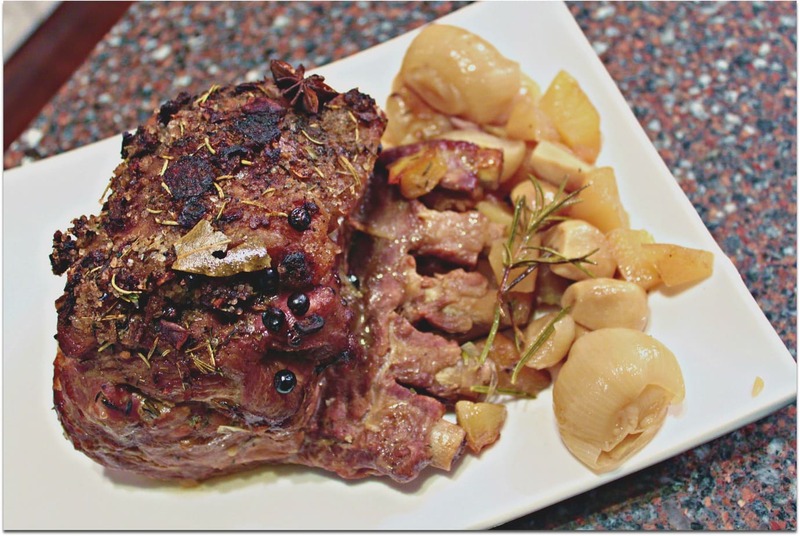 Here’s the actual Bon Appétit recipe for Cider Brined Pork Roast which is also fabulous! Bring brown sugar, 1 cup salt, 2 bay leaves, 1 Tbsp. coriander seeds, 1 tsp. peppercorns, and 2 cups water to a boil in a medium saucepan. Reduce heat and simmer, stirring occasionally, until sugar and salt dissolve, about 4 minutes. Transfer brine to a large bowl and add cider and 2 cups ice. Let cool. 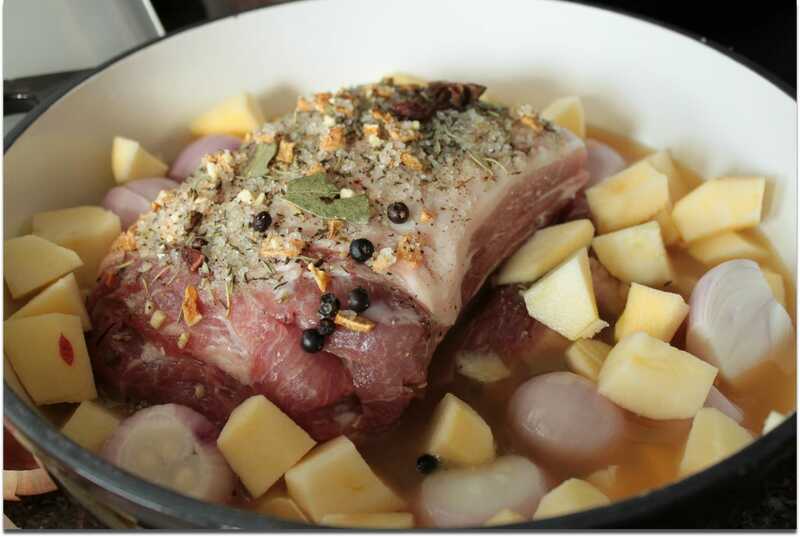 Place pork and brine in a large (2-gal.) resealable plastic bag. Seal bag and chill at least 8 hours. Remove pork from brine and pat dry with paper towels. Let sit at room temperature 1 hour. 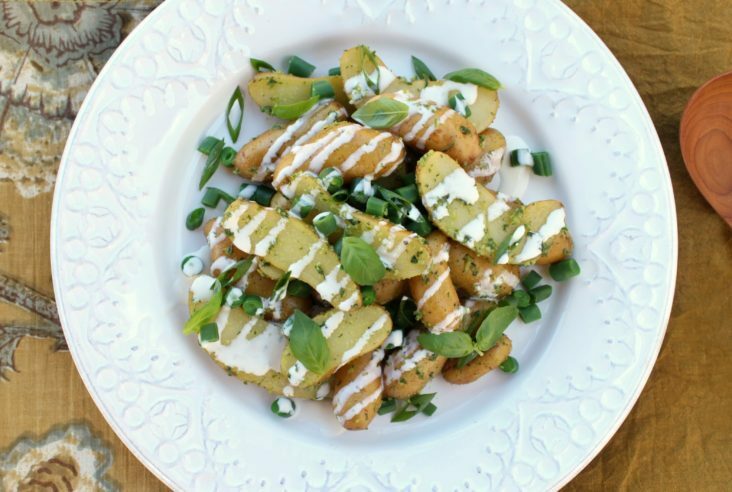 Toss potatoes and onions with 4 Tbsp. 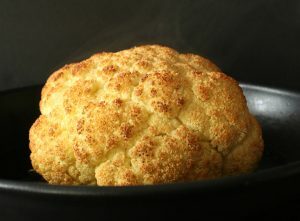 oil in a large roasting pan or on a large rimmed baking sheet; season with salt and pepper and set aside. Place rack in lower third of oven and preheat to 425°. Using the side of a chef’s knife, crush remaining 2 Tbsp. coriander seeds. 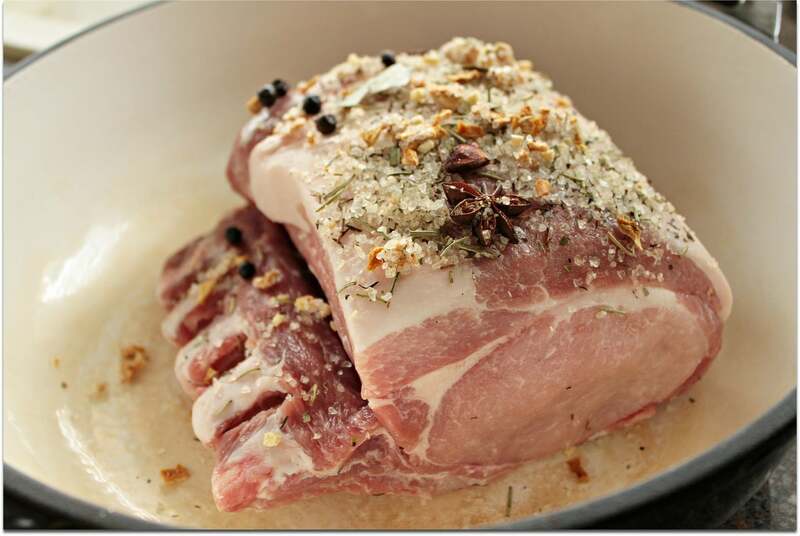 Season pork with salt and pepper and rub all over with crushed coriander. Heat remaining 1 Tbsp. oil in a large skillet over medium-high heat. Cook pork until browned on all sides, 8–10 minutes. Transfer pork to roasting pan and nestle in among vegetables. Tuck remaining 6 bay leaves under kitchen twine over top of pork. Wrap bone tips with foil to prevent burning and roast, turning vegetables halfway through, until an instant-read thermometer inserted in the center of pork registers 140°, 60–75 minutes. Remove foil from bones and transfer pork to a cutting board; let rest 30 minutes before slicing between ribs into chops. DO AHEAD: The pork can be brined 2 days ahead. Keep chilled. looks yummy… can I come to your lace next thanksgiving? Your roast pork sounds absolutely delicious. I’m a big fan of long slow roasting. Pigs are such wonderful beasts…the main reason I could never go vego.